Many among the 10,000 Orang Ulu who were resettled by the government to Sungai Asap 12 years ago because of the Bakun hydroelectric dam project, are still nostalgic about their old life in the upstream areas of Sungai Balui, which are full of natural resources and good things to eat. However, following the completion of the RM7.3 billion project and the commencement of the water catchment process by year’s end, there will be no return to their native customary rights (NCR) land as most of it will be under water. The remaining highlands will become islands in a lake as big as Singapore, which might then be developed by the government to become new tourist spots for nature-lovers or those who enjoy fishing. “These areas were previously our NCR land, but now we are told that they belong to the government. “So, we (the people who are involved in the resettlement programme) feel very sad,” sighed Miku Loyang (left), a Kayan, while pointing at Sungai Balui that has been bisected by the 232m-high dam. He was talking to a video documentary team led by senior journalist Chou Z Lam, who was fired by RTM for protesting the decision to take his programme regarding the Bakun issue off the air a few months ago. The former Kapit district councillor from Uma Balui Liko said the local natives are no longer allowed to enter the dam area unless they get permission from the authorities at the security checkpoint. This is despite the government’s promise that they can return to their old customary lands 15 years after the project was completed. “This is our place, the place where we were born, but it is difficult for us to go back now,” he stressed. He pointed out that the NCR land is important for the Orang Ulu as they are not skillful in managing money, so they need to come back to these jungle and river areas to fish and to hunt for wild boar. He said life in their new home of Sungai Asap is worse than their previous life in the upstream areas, as they are only given a small piece of land for farming and they need to use money to buy all their basic necessities. “What we need is the old land areas. We can easily find food like fish and wild boar, that’s why we want to go back, but we are prevented by the government. 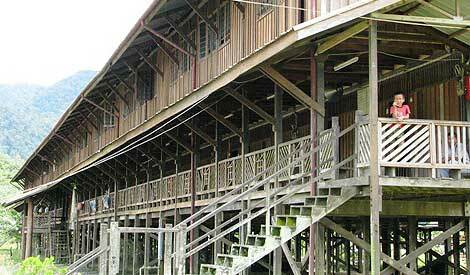 “Although we were poor, life was very easy and we still remember the natural environment of Bakun,” he said. Bengo Telang (left), 56, who is currently farming on a three-acre area of state land in Sungai Asap without government permission, also echoed Miku’s view. He misses the old life at the upstream areas as they were free to open up any of their NCR land for farming, without being controlled by the government. “Even if we opened 10 acres of land, nobody would stop us. And the land was big and fertile enough for me to plant rice. “I could get 40 to 50 bags of rice every year and I did not need eatberas cina everyday like now,” he said. He said he was given another three-acre plot by the government, but it is too far and not accessible by road. So, he has no choice to farm on state land, with the worry that the government might take back the land. The local native communities are also dissatisfied that the government has not provided enough infrastructure and assistance to help them integrate into modern life, despite all kinds of promises that had been made. The compensation for their old house, land areas and fruit trees in the upstream areas have also not been paid in full as promised by the government and they are being forced to pay RM52,000 for their new house in Sungai Asap. The government had promised that Sungai Asap would be developed into a modern town with all types of facilities and amenities, including schools, clinics, free electricity and water supplies, an airport and roads. Each family would be given three acres of land for padi and fruit farming and the local community would also be given 30 percent of the shares in plantation companies to enable them to participate in modern oil palm plantations within Sungai Asap. But according to Miku, the free electric and water supplies never took place and the number of schools and clinics were also reduced. Even the promised secondary school, SMK Bakun, was only set up in 2005, which is seven years after the resettlement programme took place, sharing the same facilities with SK Batu Keling. The building for the new secondary school will only be completed by the end of this year. They also complained about the lack of other necessary services like a bank, a post office, public transport, television signal reception, fixed-line telephone and Internet service. The villagers said the government is “not honest” in dealing with compensation for their house, land and fruit trees. Miku claimed the government owed them at least RM1.53 million for the fruit trees. Compensation for some of the fruit trees was only about RM12 instead of the RM52.55 that was promised. Besides that, other villagers claimed the state government only paid RM2,500 per acre for the land areas they lost, although the federal government was said to have allocated RM6,000 per acre of land. The land areas allotted to them are also far from the longhouse and not fertile, while the land nearby the longhouse was given to big plantation companies for oil palm plantations. However, there has been no sign that the promised 30 percent of shares in the plantation companies will be carried out. There has also been complaints from the natives that big plantation companies and logging companies have blocked the road which provides access to their farms. According to locals, Shin Yang, KTS, Sarawak Oil Palm (SOP) and Ekran are among the big companies who have a presence in Sungai Asap, while the active logging industry players include Shin Yang and Rimbunan Hijau. The youngsters also find it difficult to look jobs in Sungai Asap as the big companies prefer to hire foreign workers who are far from their families. When asked whether the locals have benefitted from Bakun, Miku said “no” without much thinking. However, the local native communities and civil society still think the government could fix the problems. Sarawak activist Wong Meng Chuo (right) said the government should reconsult the native community and provide enough government services at the upstream areas in the event that some of them would want to go back to their NCR land areas. The native community resettled in Sungai Asap has also drafted a document entitled the ‘Bakun Agreement’, which lists out their demands to the government. Among others in the 12-point agreement, the natives have requested the government to pay a sum of RM3.9 million annually as the water and electricity royalty, which will be handed over to a trust committee to utilise on local welfare. Miku stressed that the natives will only allow the government to start the water catchment process if their demands are fulfilled. “(The government) is now selling the electricity from Bakun dam, but we get nothing even though this is our state. “If the government goes ahead (with the water catchment process), we will then find someone to fight for us,” he said.